Click to read: I Had My Cardiac Enzymes Measured: A Case Study - What Does a Thallium Stress Test Involve? Most heart attacks are a result of coronary heart disease – the narrowing of the coronary arteries due to a gradual build-up of fatty material within their walls. This fatty material is called atheroma. If the atheroma becomes unstable, a piece may break off and lead to a blood clot forming. This clot can then block the coronary artery and the heart muscle is starved of blood and oxygen and could become permanently damaged. This is a heart attack and is sometimes known as acute coronary syndrome, myocardial infarction or coronary thrombosis. During a heart attack, life-threatening heart rhythms may develop, which makes it a medical emergency. If you think that you or anyone else is having a heart attack, you should call 999 immediately. Cardiac arrest happens when the heart stops pumping blood around the body because of a disturbance in the normal heart rhythm. One of the causes of cardiac arrest is a heart attack. Other causes could include such things as electrocution, bleeding, choking or a drugs overdose. The symptoms of a heart attack vary from one person to another. They can range from a severe pain in the centre of the chest, to having mild chest discomfort that makes you feel generally unwell. Women may experience different symptoms to men. 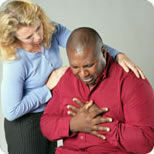 Some people can feel short of breath as well as having central chest pain. Some people can feel a bit light-headed or dizzy as well as having chest pain. If you are having or you suspect someone close to you is having a heart attack, call an ambulance. While you are in hospital, other tests may be carried out to assess your heart and decide the best form of ongoing treatment. What treatment could I expect to receive? You could be given pain relief, oxygen and aspirin and a combination of medication, which you should keep taking after you go home. Thrombolysis: a treatment that helps dissolve the clot that is blocking the artery and helps to restore the blood supply to the heart. It involves injecting a drug in to the blood stream. Thrombolysis is sometimes called a clot buster. Coronary angioplasty: a treatment to widen the artery. Can I prevent coronary heart disease and heart attack? Yes - even if you’ve had a heart attack there are several things that you can do to reduce the risk of future heart problems. If you have diabetes, controlling your blood glucose as much as possible. Tony first became aware that something was wrong when he was watching TV at his home in Reading. “I had been feeling tired, but nothing unusual and my left arm was aching. I put it down to having pulled a muscle or something like that. As I watched a film with my wife, I started to feel much worse and my arm and chest began to feel very painful. My chest felt as though someone was sitting on it and I struggled to breathe,” says Tony. He was having the classic symptoms of a heart attack and his wife Helen acted quickly, called 999 and an ambulance arrived within minutes from the Royal Berkshire Hospital. Helen travelled in the ambulance with Tony, keeping out of the way as the paramedics monitored his heart rate and gave him oxygen. They were at the hospital within 15 minutes and Tony was rushed to the cardiology emergency team. “By this time, I was feeling more panicky and realised that this could be it for me – it sounds melodramatic, but it did worry me that I was not going to make it,” remembers Tony. So many monitors were hooked up to Tony that he now jokes that he was using up most of the electricity being produced by the national grid that night. With emergency treatment, his condition was stabilised quite quickly and then the doctors began to do some tests to see how bad the heart attack had been. “The cardiologist explained that some key cardiac enzymes were going to be measured. He said that this would help them to find out whether this had been a mild heart attack, as they suspected, or if it was more serious than it seemed,” says Tony. Cardiac enzymes are molecules that are released as heart muscle dies, as it does when a blockage in a coronary artery cuts off the oxygen to heart muscle during a heart attack. The most reliable blood marker for heart muscle damage is a protein called troponin. This is a protein released only by heart muscle that has died; it is never normally present in blood but levels do rise after a heart attack. The higher the level of troponin in the blood within hours of symptoms of a heart attack, the more severe the cardiac episode has been. “The test itself took some of my blood and it was sent off to the biochemistry labs. As well as troponin, other cardiac enzymes were also measured,” he recalls. Other markers of a heart attack include creatine kinase, lactate dehydrogenase, myoglobin and natriuretic peptides. Afterwards, Tony did some research on the internet and found out that the levels of troponin I and troponin T in the serum of people who have suffered chest pain can predict those most likely to die from their heart attack. “I didn't realise it was such a big deal at the time and Helen just thought it was a standard test. When the results came back that no troponin had been detected, we didn't realise the significance at first,” explains Tony. Later, the cardiologist in charge of Tony's care took more time to explain the results and told the couple that the lack of troponin in Tony's blood was a very encouraging sign. It meant that his heart attack had been fairly mild and, because he had been rushed to hospital so quickly after his symptoms worsened, there was less damage to his heart muscle than their might have been with a delay. “That made me feel better, although it was still a long time before I was on my feet again. I feel I now have to care about my health much more and I have done a full cardiac rehabilitation program. With regular exercise and healthy eating, I hope to avoid ever having to repeat my experience,” says Tony. If you have symptoms of heart disease, or a family history that suggests you may be at risk, it is important to have tests to monitor the way that your heart is working. 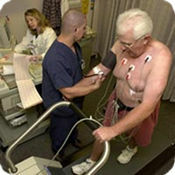 The thallium stress test is one technique that is useful for visualising how well the blood flows to the heart muscle and through the heart when you are exerting yourself and when you are at rest. It is called a stress test because it involves putting the heart under stress to see how it behaves. This is done either by exercise or by giving a drug to make the heart work harder.